There’s a lot of public dialogue about income inequality these days. 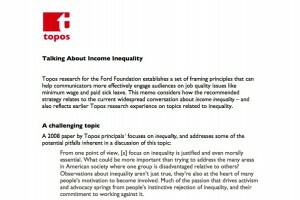 In a new memo, Topos principals consider the best approach to building public understanding on addressing this economic issue in light of their recently released research on building support for job quality policies like paid time off and higher minimum wages. A dramatic rise in references to income inequality – among leaders, journalists and advocates, and disseminated in all media – suggests that influential individuals feel the climate has changed in ways that make an inequality discussion more palatable than it has been in the past. Since 2008, the economy has changed and the Occupy movement made headlines, so can we assume that earlier cautions no longer apply? We should be very careful about assuming that is true – partly because the challenges discussed in the 2008 paper mostly arise from fundamental cultural perspectives and cognitive tendencies, that don’t change quickly, if ever. 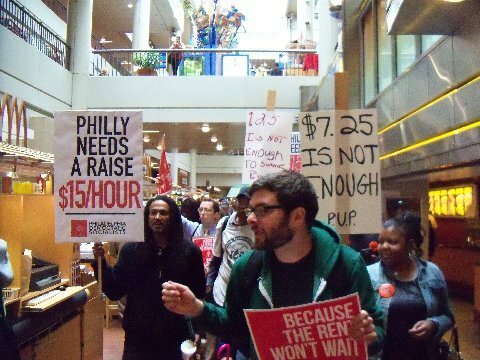 The Pew Center conducts a regular survey of American values and in a recent report, the Center’s founding director Andrew Kohut and his co-author conclude that there’s been no real shift in public opinion about economic inequality despite the fact that there’s been more media attention to the issue since the Occupy movement and the 2012 election. Overall, our goal is to help see people see the bigger picture – of what is happening, how it is happening, who is affected, etc. With this in mind, we may be better off not using the word inequality as a leading idea, and using other words for now.